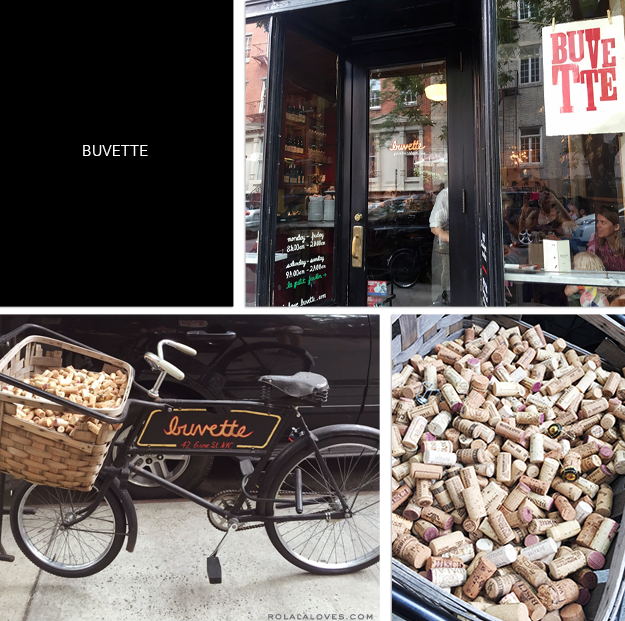 Buvette is a cute cafe just west of Seventh Avenue on Grove Street in the West Village which you can easily locate by spotting the bicycle with the basket filled with wine corks sitting outside. The concept is modeled on Parisian bistros and the menu from chef Jodie Williams features a number of French food staples. A long marble counter runs along the bar and closely set small tables and chairs fill up the 1,000 square foot space which is decorated with flea market chic knick knacks. There is a dining room with a long table for large groups situated in the back adjacent to a narrow outdoor garden area. They're known for their steamed eggs which are cooked with the steam wand of an espresso machine. We got the one with goat cheese, sundried tomatoes and capers. These had to be the softest and fluffiest eggs I've ever tasted and the flavor was totally on point. We also had the Salade De Poulet with roasted chicken, haricots verts, butter lettuce and potatoes in mustard vinaigrette and beets with a horseradish creme fraiche. Both of these dishes were delicious. This is definitely a place where you go for the food but I would note that their portions are not meant for hearty eaters. The cozy space is somewhat cramped and the tiny tables and chairs actually made me feel like I was oversized. Our service was good and the members of the wait staff that I interacted with were all pleasant. They don't accept reservations so expect a wait if you arrive during meal rushes. They are open late until 2am and have also opened up a branch in Paris. There were some menu items that I wouldn't mind returning to try. 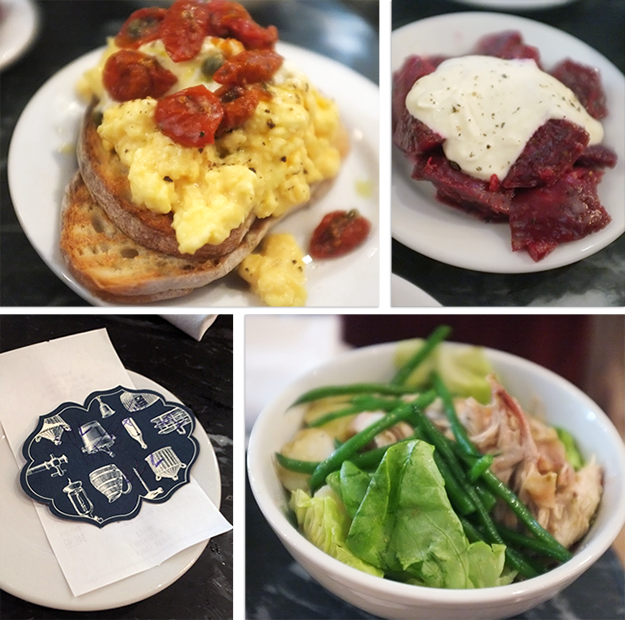 I'm a little behind on my Dine Out posts right now since it was about a month and half ago that I met up with my blogger friend Andrea for lunch at Buvette. You're really never sure what to expect when you meet someone you've only interacted with on the internet and it's always a pleasant surprise when the person actually turns out to be pretty much like what you'd expect from their online persona. After settling into a comfortable conversation, it just felt like we were old friends. Andrea is one smart and cool lady. 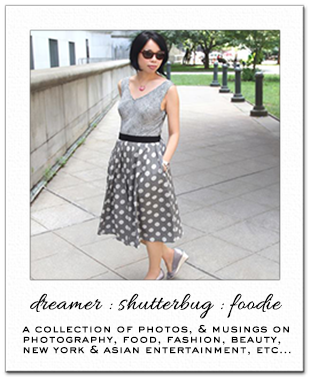 She writes about her adventures in LA having just moved there recently from NYC on her blog inBusinessandLife. Go say hi and tell her I sent you! Are you a fan of French cuisine? What's your favorite dish? To be honest I have never visited a French restaurant, but if you've tried a French-style breakfast, maybe it's time to get to know more French cuisine, find out what alternatives have in my city. The dishes that you show us look delicious! Kisses. Mmmmm. So hungry right now and I've still got 1 hour until dinner! I can't say that I've tried French cuisine, at least not at a restaurant - I don't think. My aunt is French though and I do love her cooking. Though I hate pate. She "tricked" me into eating it once. Didn't like it, but don't tell her that! hahaha! Lovely place and the food looks delicious!!! French food is delicious, and very flavoursome. 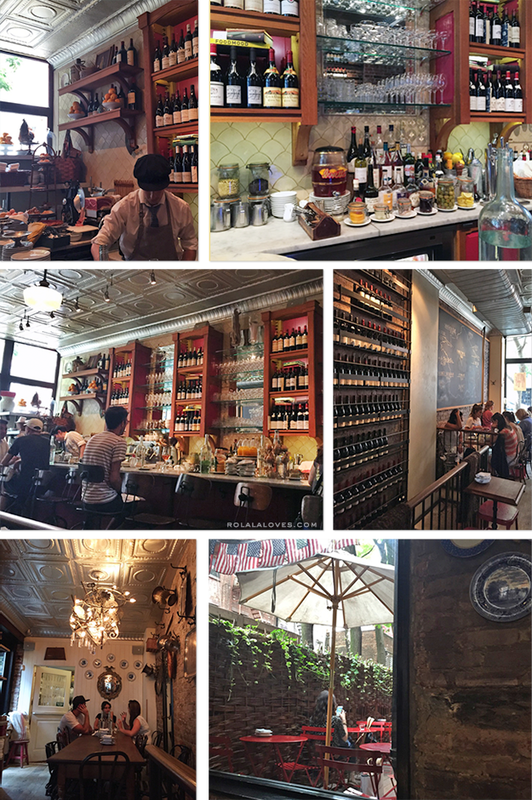 What a quaint place to enjoy a delicious meal and try wine you always find the best places only NYC has hidden treasure. Have a great weekend. i love hearing about places like this!! I must admit that I am not the biggest fan of French food or at least what was referred as French food back in Malaysia. Never had any here yet, might be a little different. I do love the the decor and how the food was plated, everything looks lovely. I am who you will call a hearty eater so while I love the looks of this cafe, I think I would be really annoyed with the small portion. Haha! Buvette looks like a charming place to dine out. I really like the setting, but I am drooling over the eggs you had! It's really nice that you had the chance to meet in personal with a fellow blogger! I wish I could do that too! I have never met a fellow blogger in my life. Hope this will be fixed soon! Happy Friday, Rowena! It looks and sounds like an interesting and charming place, and nice that it stays open so late. Sometimes we have those late night cravings if we're already out. The wine selection already has my eyes peeled. I love it when you meet bloggers and they are exactly like their blog. What charming and pleasant eatery and so cool that you got to meet a fellow blogger in real life! I don't know much about French cuisine so don't have a favorite, but I've enjoyed everything I've tried so far. Have a good weekend. You show us only the best places to dine out! Love French food. happy weekend ! Love wineries with yummy bits of food! I love French cuisine, and I'm loving the bicycle with the wine corks...such a cute idea! European size servings huh, haha. But this sounds very good and the ambiance too. So awesome it was a great meet up. I have met with a number of local bloggers and have always had a great time. And I will check out her blog. I really love the look of the inside, that's so adorable, we don't have too many places with this decor where I live. Hi Rowena, the place looks very adorable and cozy. I love French cuisine. Actually I love everything French :D It not really a dish but I love chocolate croissants :D The have the best. I said hi to Andrea and told her you send me :D Happy Saturday! How nice and cozy place! French food is so delicious! Oh boy, totally smitten with this place and I love French food:) Kisses, darling. How fun that you met a blog friend for lunch! I've met some of my blog friends in real life and they have all been lovely! Thanks for another restaurant suggestion when we're in NY again. We were in for a quick trip earlier this summer when my niece was attending a fashion camp at FIT. I love french food and wine. Creme brulee is definitely top on my list. I love the basket full of corks. Have a fabulous week, :))). This looks like such a lovely place and the food, of course, looks delicious! I can't say that I'm a fan of French cuisine but that is probably because I never had any! Italian restaurants are more popular than French ones here, but I would love to give French cuisine a try. This place sounds charming! That bike with a basket filled with corks...how cute is that? I would probably be ok with European size servings as that is what I'm already used to.